When sales of the master-planned Brentwood Gate community outpaced expectations by two to three years, developer Ledingham McAllister knew they were on to a good thing. So naturally, they hopped across the street and acquired more land in this key Burnaby location in a bid to meet the high demand for the neighbourhood. Now, two years later, Memento, a West Coast-inspired craftsman low-rise building, is ready for its debut. The grand opening is scheduled for Sept. 12 and, with the development nearly completed, buyers will get to see exactly what’s on offer. “They get to walk through the home, they get to see the view, the excellent finishing. None of it is left to guesswork,” says Manuela Mirecki, senior vice-president of marketing for Ledingham McAllister. Memento is located on Beta Avenue at Lougheed Highway, two blocks east of Willingdon Avenue and within minutes of the SkyTrain station and Brentwood Mall. Across the street is the Brentwood Gate community, comprised of seven buildings, which sold quickly when the first phase launched in 2006 and now has less than half a dozen units left. “The response to that community was unbelievable,” says Mirecki. With the success of Brentwood Gate, the long-time Vancouver developer had the confidence to continue with the construction of Memento, even through 2008, when many B.C. developers were halting projects in the wake of an economic recession. Mirecki says the location has been one of the biggest draws for buyers. Memento has 87 units, with the smallest condos at 687 square feet and starting at $269,900. While part of the L-shaped building fronts on to Lougheed, most of the condos are positioned along Beta Avenue to maximize privacy. The inner courtyard, with south facing views of Burnaby, is surprisingly quiet while the architecture is heavy on timber details and stone columns in an ode to classic West Coast style. Inside, the suites all have either patios or balconies, electric fireplaces and kitchens equipped with stainless steel appliances and granite countertops. The furnishings in the show suites tell the story of whose buying: The two-bedroom suite of 800 sq. ft. comes with two bathrooms and is furnished to show how a small family could comfortably fit in the space. Meanwhile, the one-bedroom and den is feminine, furnished with designer, Burberry accents. Mirecki believes potential buyers of Memento will be similar to those who bought at Brentwood Gate — crossing all age groups and ethnicities, from first-time home buyers to empty nesters downsizing, but who share the common desire to live in homes they buy. Sizes: One bedroom plus den from 687 to 770 sq. ft.; two bedrooms at 805 sq. ft.; two bedrooms plus den from 869 sq. ft. to 915 sq. ft.
Open: Grand opening is Sept. 12. 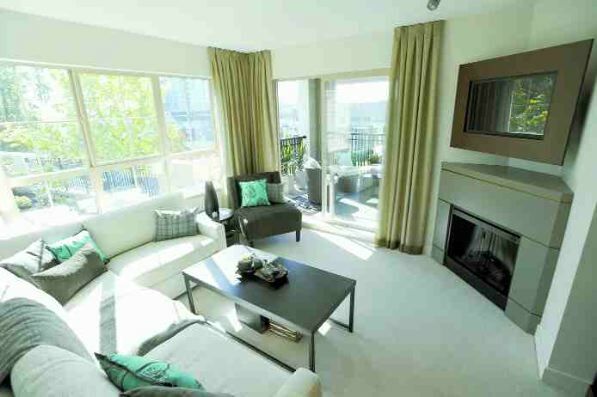 The sales centre opens daily from noon to 6 p.m. (except Fridays) at 2088 Beta, Burnaby. Dear Condo Smarts: Several of our owners have heard on a number of talk shows this week that strata owners are now going to have to pay the harmonized sales tax on their strata fees. Is this true? This will immediately add 12 per cent to all of our costs at a time when we can hardly get the owners to approve a one-per-cent increase. Dear Wendy: The HST is basically being applied to those goods and services where GST and/or PST were applied. Until the tax guide for HST is published for B.C., it will be difficult to establish the total impact, but it will have an impact on strata corporations. Residential strata corporations and residential strata lots, if they qualify, are deemed to be non-taxable corporations under the Income Tax Act. A residential condominium corporation that qualifies as a non-profit organization under paragraph 149(1)(l) is exempt from Part I tax on its taxable income but is required to file Form T1044, Non-Profit Organization (NPO) Information Return, with its T2 tax return. As a result, there is no GST or PST charged on residential strata fees, so the HST will not be applied to residential strata fees. Commercial strata corporations and those residential strata corporations that are used for commercial purposes, such as a hotel, may be subject to GST and, as a result, HST on their strata fees. The strata corporation in these situations is likely already registered for a GST number and will modify their collections for HST. Now for the real costs. If your strata is a small 10-unit, self-managed complex and you maintain your own buildings, your increase on costs is likely going to be around 0.5 to two per cent of your total costs. But look at a large 350-unit, three-tower complex where there is a range of labour services that are currently only subject to GST. On a $1.5 million budget, the strata probably pays $100,000 in management fees, and another $200,000 to $400,000 in contracts for janitorial, landscaping, building maintenance, inspection services, labour and consulting. The potential impact on the total annual budget is going to be an increase of two to four per cent of the total budget. Don’t forget, when it comes time to do that new roof., when you paid only five per cent GST on the labour, it will cost you 12 per cent HST after July 1, 2010. The coming year will be an important time for strata corporations to review services, cost allocations for labour and administration and prepare for the possible increases. For more information on taxation and condominiums (strata properties in B.C. ) go to: www.cra-arc.gc.ca , type in the word condominiums and select the first bulletin IT304R2 — Condominiums. Since the provincial government, in the middle of an otherwise perfectly good summer, surprised everyone with its intent to pursue tax harmonization, there certainly has been a great deal of hissing. Granted, some business sectors will benefit from combining the provincial (PST) and federal (GST) tax systems, and they will, cross their hearts and hope to die, pass on their savings to consumers. I understand and respect their reasons for supporting harmonization (HST). It’s just that I am more than a little choked that buyers of new homes and homeowners renovating their homes will pay significantly more tax on these major expenditures next July, when the HST is implemented. The current tax burden on new homes is staggering. Four levels of government — federal, provincial, regional and municipal — take turns plucking feathers from the goose, cleverly disguised as a homebuyer. Make no mistake, all taxes, regardless of when they are assessed, are borne by the buyer. Without publishing a spreadsheet along with this column, here’s a rundown of the taxes, fees, levies and charges that are applied on a new home. And pardon me if I inadvertently leave out a couple. There is the property transfer tax (PTT) on the building lot, builder licensing fee, sewer and water levy, school site acquisition fee, subdivision fee, building permit fee, development cost charges, embedded PST on all costs, PTT again on the purchase of the completed home, and the GST. I asked a prominent award-winning builder to figure out the total taxes and fees on a home his company is building. He put me in touch with his controller, a chartered accountant. We settled on basing a reasonable example on a single-family home under construction in Maple Ridge. For the record, I have no quarrel with Maple Ridge; the subject home just happens to be there. The home — a 2,200-sq.-ft., three-bedroom, 2-1/2 bath home with double garage and unfinished basement – has a selling price of $565,000. The total included tax burden is a whopping $75,500. That same home under HST, including the proposed input tax credits and $20,000 rebate, jumps to $572,500, an increase of $7,500 or 9.9 per cent more tax than the current system. So, under HST, the tax burden on that new home next July will be $83,000. There are police officers, firefighters, nurses and teachers among the homeowners in that Maple Ridge subdivision. They are hard-working, average family folks who likely don’t give a tinker’s damn about productivity, competitiveness or other buzzwords used to promote the benefits of the HST. They do, however, worry there might be too much month left at the end of their paycheques. I wonder if this enlightened number cruncher feels the same way about someone having to pay an extra $7,500 in taxes in order to purchase an average-priced home? Don’t know about Mr. Spector, but most folks take a long time to save $7,500 from their take-home pay after taking care of the bills. Assuming the buyer of that Maple Ridge home has a down payment of 20 per cent of the purchase price, it is reasonable to presume 80 per cent of the $83,000 in taxes ($67,000) is going to be included in a mortgage. Based on a six-per-cent interest rate amortized over 25 years, the interest on that $67,000 worth of tax buried in the mortgage will cost the homeowner an extra $61,600. And mortgage qualification for some buyers could also be affected by the higher cost of HST, as lending institutions aren’t exactly rubber-stamping mortgage applications these days. I would like one brave builder to step up and advertise his homes like the automobile dealers advertise their vehicles. You know, a photo of a shiny new car accompanied by a too-good-to-be-true price with an asterisk after it. At the bottom of the advertisement, beside the corresponding asterisk, are about five lines of impossible-to-read explanations of what is not included in the advertised price – taxes, finance charges, license, fees, paint charges, battery and tire levy, air conditioning levy, etc. That Maple Ridge home, which carries a price tag of $572,500, would be advertised as $489,500, plus applicable taxes, fees, charges, levies, etc. That sure sounds like one sweet deal. Being an inquisitive guy, I asked the builder about his profit margin. After land costs, development-related expenses, construction costs, staff salaries and office expenses, his margin is razor thin. The provincial government should ensure the HST on new homes is tax neutral — homebuyers must not pay any more tax on their new homes under harmonization than they do now. If tax neutrality is not achieved, watch for the hissing to reach a fever pitch next July. Chatting with Allen Garr, a journalist who also happens to be an urban beekeeping advocate, I’m happy to learn that honeybees, unlike wasps, are not carnivores. They don’t sting you, like wasps, unless you go asking for it. “I’m not sure if they’re vegans,” he adds. So I cannot say it took any courage at all to meet some 180,000 honeybees at a third-floor rooftop apiary at the Fairmont Waterfront in Vancouver, just across the street from my office. In fact, it’s one of five Fairmont hotels in North America with bees buzzing around the property. And, after talking bees with the hotel’s beekeeper, I see a morality tale in the life of bees, which I’ll get to later. At the Waterfront, bees check into three white condos, known as supers in the apiculture world. I can see a few bees lighting on flowering plants in the organic bee garden nearby. Looking down the street, I see the Vancouver Convention Centre’s grass roof. Soon there will be beehives there, too. As to why we’re seeing more and more honeybee hives in public facilities, it’s becoming very clear. Without them, we’d have a radically different diet and I’m not talking about the lack of honey for our tea. About a third of cultivated crops depend on pollinators, and in Canada, honeybees are the most common pollinators. “Without bees, 90 per cent of our food crops would diminish. Every flowering tree would die. We’d be left with corn, beans, wheat, rice, that’s it,” says Graeme Evans, the hotel’s director of housekeeping who became the resident beekeeper, thanks to his passion for bees. “In fact, we wouldn’t have the feed for cattle, chicken and pigs. Some say in the worse case scenario, if current rates of decline continue, we’d be out of bees by 2024. That’s why we do what we do.” Ditto the Paris Opera House, the White House and Chicago City Hall, apparently. Garr, the beekeeper at the VanDusen Botanical Garden, UBC Farm, Science World and the UBC Botanical Gardens, says some 30 to 35 per cent of colonies were lost in the last year. “It was the same the year before and the year before that.” Disease, pesticides, herbicides, monoculture agriculture and habitat loss account for a good part of bee loss. 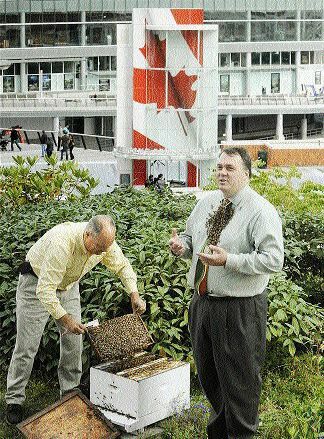 The Fairmont Waterfront started with 60,000 bees last year and currently has around 180,000. The bees have a feeding radius of six kilometres and that includes the hotel’s own herb garden and Stanley Park. This year, they’re expecting to harvest 400 pounds of honey, which will be used by the hotel’s kitchen, and also bottled for guests. As the hotel colony grows, excess bees are split off and taken to the Honeybee Centre in Surrey where they continue to form additional colonies. Evans can follow summer in the honey. “Right now, they’re bringing in a citrusy caramel flavour. It’s absolutely sublime. It’s from a lot of sources. If you go further down in the hive [bees deposit their honey in a semi-circular pattern], we’ll get licorice flavour coming from the fennel in our garden. It’s such a strong flavour that even a small amount of nectar flavours the entire honey. Our chef uses this for duck and rolling pecorino cheese. It’s excellent with wild salmon. Even further down the comb, there’s minty flavour. You can see the different colours from when they’ve extracted from different sources. The first flow is when our lavender comes out, but blackberry and raspberry are mixed in there, too,” he says. The hotel’s chef, Patrick Dore, incorporates honey into the lunch, dinner and cocktail menus at Herons Restaurant and Lounge and through September, the restaurant will feature a $49 honey menu which includes a honey lavender vinaigrette on a salad, honey-roasted duck breast, apple pie with honey goat cheese ice cream and a mignardise of honey and white chocolate truffles. Highlighting the work of bees, Evans says an apple tree in the hotel garden previously yielded about 20 apples a year. 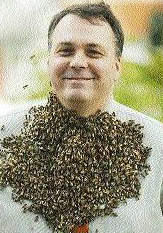 Since bees were brought in, it produces more like 200. “The bees’ interaction with its flowers excites the trees,” he says, ensuring he doesn’t anthropomorphize the bees. And yet, we end up talking about bees as if they were people. He loves their moral sense. “Their entire culture is derived around keeping the hive alive. Every bee produces one teaspoon of honey. Together, they can produce 360 pounds. We sometimes struggle in our own society with feelings of powerlessness and what we can do in the face of global warming. What if every bee thought that way and gave up on the one teaspoon?” he says, Socratically. Longtime city hotelier Stephen Darling won’t have to frazzle himself by working at breakneck speed anymore. He leaves his position next week as general manager of the Shangri-La Hotel in Vancouver, just seven months after opening the upscale property at Georgia and Thurlow. He was recently named a director of a Swiss-based private trust, and has put his name forward to be considered as a member of the provincial government’s new tourism advisory council. “I would like to pick up three or four directorships and do some charitable and contract work, and just not work at 500 miles an hour anymore,” Darling said. He rejoined Shangri-La Hotels and Resorts five years ago and spearheaded its efforts to expand the brand throughout North America. The recession delayed a few U.S. opportunities, but the Vancouver hotel opened this year and a new Toronto Shangri-La property is scheduled to open in 2012. Darling had previously been general manager of the Westin Grand Hotel and the Pacific Palisades Hotel, which used to be a Shangri-La property. He said he’s excited about his business future, and noted several colleagues have already called to say they wish they could do the same thing. “Our staff are happy and getting maximum hours in hard economic times, and that makes me happy,” Darling said. Ed Brea — currently general manager of Traders Hotel Kuala Lumpur — will take over as Shangri-La’s new Vancouver general manager at the end of September. He was previously hotel manager at Island Shangri-La in Hong Kong and general manager at Shangri-La Hotel, The Marina, Cairns. 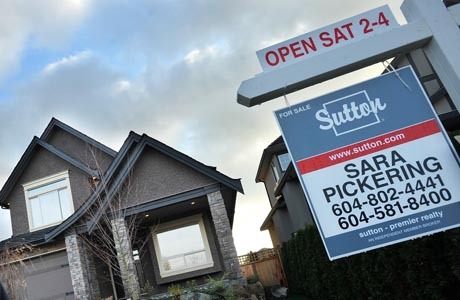 Spurred by record-low mortgage rates, provincial real estate sales should continue to rise through the remainder of 2009 from last year’s market fall, according to the B.C. Real Estate Association’s latest forecast. Home sales have doubled since January’s near collapse in sales, association chief economist Cameron Muir said in a news release. He expects transactions recorded through the Multiple Listing Service to climb some 15 per cent from 2008 to 79,400 units. Prices, although edging up from their declines through the last half of 2008, will remain below last year’s levels before showing slight gains again in 2010, according to Muir’s forecast. The provincial average price for a home of $451,200 will be one per cent below the 2008 level, and should show a one-per-cent gain to $457,600 in 2010. B.C.’s 10-year average for housing resales is about 83,000 units. Economic forecasts continue to indicate that the province’s recovery from recession will be slow, however. Central 1 Credit Union was the latest with its forecast that B.C. will experience below-average growth until 2012. Muir’s expectation is for provincial unemployment to average 7.7 per cent this year, and go down only marginally next year. However, he does expect the slow recovery from recession to start creating jobs that will help support demand for housing at that 10-year-average level. Muir sees housing as a brighter spot in the economy, which will likely spill over into other areas, such as retail sales. However, economist Helmut Pastrick, with Central 1 Credit Union, believes Muir’s forecasts are somewhat conservative given the pace of sales in recent months. Over the short term, with the Bank of Canada vowing to keep its trend-setting overnight rate at 0.25 per cent until the middle of next year, there seems to be little risk of mortgage rates rising. Muir noted that most first-time homebuyers lock in mortgages for five-year fixed-rate terms, so they should be insulated from rising rates. In a recent report, Scotiabank Economics senior economist Adrienne Warren noted that the average new mortgage payment in Canada in 2009 declined 26 per cent from its peak in 2007, due almost entirely to the reduction in mortgage interest rates. Pastrick said the increase in interest rates should “be a self-correcting mechanism,” and if the province does not fall into the dreaded double-dip recession, they should rise as the overall economy improves. The recovery of sales, however, hasn’t been shared equally across the province. Metro Vancouver, Victoria and the Fraser Valley have seen relatively sharp rebounds, while the South Okanagan, the Kelowna to Vernon region and Kamloops are forecast to see much slower recoveries. Muir expects housing starts to remain depressed for the remainder of this year, and not recover by a lot next year. His forecast is for 14,800 new home starts by the end of 2009, which is only slightly higher than the most recent low of 2000. Muir added that if some of those starts do not materialize and they fall below 14,400, that will be the lowest level of new home construction in the province since 1962. The B.C. Real Estate Association is forecasting a better sales season this fall than last, hoping to see the last of the housing recession. In its latest third-quarter housing forecast, the association predicts that Multiple Listing Service residential sales will go up 15 per cent this year over last year. In 2008, there were 68,923 units sold in the province, a sales drop of 33 per cent, according to the report. By the end of 2009, the provincial real-estate board, which represents the interests of 12 regional real-estate boards and more than 17,500 B.C. realtors, hopes to see 79,400 units sold, up 15 per cent from 2008’s lows. In 2010 they are aiming for 84,200 units sold, an increase of six per cent over this year. The 10-year-average for sales is 82,800 units. The BCREA also anticipates that more homes can be sold in 2010. It is forecasting a sales increase of six per cent across the province for 2010. “After twelve months of significant volatility in B.C.’s housing markets, greater stability is expected through 2010,” BCREA chief economist Cameron Muir said. It expects growth in 2010 in Greater Vancouver with a predicted four-per-cent increase, in the Fraser Valley with a five-per-cent increase, and in Victoria with an anticipated nine-per-cent increase. Double-digit sales increases over 2009 are forecast for the Sunshine Coast (15 per cent), the Northern Lights (12 per cent), Okanagan Mainline ( 12 per cent), and Kootenay (11 per cent) real-estate boards. All of the boards had sales declines in 2008, and in some regions sales were down as much as 39 per cent. All but three regions had better sales rates in 2009 over 2008. In 2010, all boards are expected to be in positive territory. With an assumption of better sales comes an anticipated increase in sales volumes. In 2009, $35.8 billion of real estate changed hands. In 2010, the real-estate industry hopes to see $38.5 billion in sales. The association also made predictions on a rebound in housing starts. This year has so far been a “dismal” one for housing starts, the association said, with a forecast total decline of 57 per cent by the end of this year compared to 2008, which was also a low year (starts in 2008 were down 12 per cent). That comes to a total of just 14,800 units built in 2009, the lowest level of activity since 2000. In 2010, the association predicts, starts in the province will regain some ground, with an estimated 18,500 units forecast to be built. Muir cautioned, though, that recovery would be spotty. The association noted that the uptick in housing sales over the traditionally strong spring/summer season is the “brightest light” in an otherwise dark B.C. economy. NEW SPACE RACE: Recessionary chills are declining in numerous economic sectors. High among them is housing, on which the development community is throwing warm water again. With the $330-million Woodward’s redevelopment closing, 160 buyers received their keys last week. Meanwhile, that project’s Ian Gillespie appears nearer to acquiring the Bayshore property. That should see two condo towers and a second hotel — estimated value $127 million — added to the Coal Harbour waterfront site. Gillespie reportedly now has until mid-October to complete due diligence on the deal. As for hotels, don’t expect a 127-room Ritz Carlton on West Georgia Street. Malaysia-based Holborn Group president Joo Kim Tiah still has contractual obligations to renegotiate with the hotel chain, but the Arthur Erickson-designed 58-floor tower-with-a-twist should go ahead again in March with smaller, less-ritzy condos on the upper floors and a different-named hotel below. Original condo-buyers’ deals were cancelled in April. Multi-property owner Rob McDonald later half-joked it’d be a good site for Starwood Hotels & Resorts Worldwide’s luxury St. Regis brand. He’d just spent $11 million refurbishing his Dunsmuir-at-Seymour St. Regis hotel and has legal right to that title here. Still, Tiah’s father, Holborn chair and TA Enterprise executive chairman Datuk Tony Tiah Thee Kian, owns the now-renovating,185-room Aava Whistler hotel and others, so who knows? On one of downtown’s smaller sites, at Hastings off Hornby Street, the 31-floor, $180-million Jameson House looks ready to roll again with Bosa Properties founder Robert Bosa supplanting brothers Tony, John and Tom Pappajohn, and son-president Colin Bosa running the project. Original purchasers have reportedly been offered renewal discounts from one to 15 per cent. The question for the Bosas and marketer Bob Rennie will be whether to sell hard right away or wait a year for better prices and activity. Meanwhile, 250 buyers marched past the B.C. Regiment’s Beatty Street drill hall recently to pay some $600 per square foot for all the units of Concord Pacific’s adjacent Cosmo project. Metro Vancouver saw house prices tick higher in June after 11 straight months of decline on one bank’s index measure of property values. With three other major cities on the index measure also showing price recovery, the National Bank of Canada is suggesting “[the] worst of home price deflation in Canada is therefore behind us,” according to a note from bank economist Marc Pinsonneault. In June, Vancouver home prices rose 1.6 per cent from May based on the Teranet-National Bank house price index. However, Vancouver prices were still down almost 11 per cent from their peak on the index in August 2008. Nationally, Pinsonneault said real estate sales versus new listings slipped into seller’s market territory, and remained there in July. “This is an environment conducive to continued improvement in home prices on a monthly basis,” he said, concluding that the worst of the housing downturn could be over. The Teranet-National Bank index is based on repeat or paired sales of homes, so it captures direct examples of changes in value, rather than only the average value of all homes that sell in a given month. National Bank spokesman Simon Cote said that in June the number of Metro Vancouver’s paired sales exceeded the number in the same month in the previous year for the first time since May of 2008. Adrienne Warren, senior economist with Scotia Economics, concurred, saying, “Metro Vancouver is experiencing the same trend of firming sales and prices. “Demand is benefiting from a little bit more optimism in the economy, and certainly low interest rates,” Warren said. She noted that those low rates are the biggest factor in the 25-per-cent decline in average monthly mortgage payments since the late 2007 peak. She added that if there is any concern it is over whether or not the buyers of today face substantially higher interest rates when they go to renew their mortgages. Housing-market indicators in the United States are also turning more positive relative to bone-jarring declines that marked the subprime meltdown and drove housing prices 31 per cent below their peak in 2006, TD Bank chief economist Don Drummond said. On Tuesday, the S&P/Case-Shiller composite index showed home prices in the U.S. bouncing higher for the second straight month. And on Wednesday, the U.S. Commerce Department announced new-homes sales surpassed expectations by increasing 9.6 per cent to 433,000 units in July, the biggest increase in more than four years and the highest level of activity in 10 months. Though residential real estate accounts for only five per cent of each country’s economies, Drummond said rising home prices boost household wealth and spending power, and carry a psychological boost to recession-weary consumers beyond their numbers. Renewed strength in the Canadian market was evident in four of six major markets tracked by the Teranet-National Bank survey. Montreal posted its fourth straight monthly increase, up 1.2 per cent; Ottawa gained 2.1 per cent; and Toronto recorded its second straight month of gains, up 2.3 per cent. Halifax and Calgary were the only laggards, each slipping 0.2 per cent. For Calgary, it was the 12th consecutive losing month. Open Tuesday to Friday for lunch; Tuesday to Sunday for dinner; and Sunday for brunch. 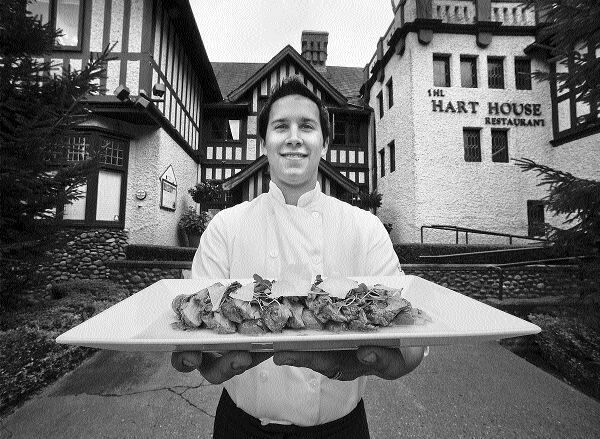 Hart House, the elegant 1910 mansion on Deer Lake in Burnaby, is understandably a popular spot for weddings and other special occasions, and the restaurant, which opened in 1988, has a loyal following. No one would be foolish enough to make a radical change to Hart House, which is traditional in the best ways — a handsome property with lovely views on to the garden and gracious service. It’s a long way from the concrete floors and pounding music of Yaletown, and patrons wouldn’t want it any other way. Yet Hart House’s three young, relatively new chefs have set about to add to the menu, to make it more current and appealing to Vancouver’s foodie population. One of the three, Kris Kabush, said in an interview, “We’re trying to update the menu and make it more sophisticated and West Coast.” For example, the veal sweetbreads and seared scallops are done in an Indian garam masala crust. The trio, Will Lucas, Breck Lemcke and Kris Kabush, are sharing the role of executive chef, brainstorming their way to new recipes. Isn’t that unusual? I asked Kabush. Aren’t kitchens traditionally quite hierarchical? Kabush allowed that is often the case. In his 26 years (that’s of life, not career), he’s worked at many of Vancouver’s top restaurants, including the Wedgewood, Lumiere and Feenie’s. He trained, as did colleague Will Lucas, at Vancouver Community College. On a recent visit, my friend and I found that some of the new dishes were wildly successful and some less so. Our starters were both terrific. My endive salad was the perfect marriage of light dressing, candied hazelnuts and grapes, with a chunk of chevre on the side. My friend’s seafood appetizer, with warm crab salad, rare ahi tuna, and prawns and scallops in broth, was nothing short of spectacular and left us wanting more. Each of the tiny portions provided a mix of textures and original flavours. For mains we had one of the more conservative dishes (beef tenderloin) and one of the new ones, smoked duck breast. The duck is prepared in a smoker on site, cold smoked over hickory and maple wood, then roasted in a traditional manner. Unfortunately, to my taste, the smoked flavour overwhelmed the taste of duck, which I would have preferred simply roasted. The accompanying gnocchi and light, fresh fennel provided a welcome balance. No fault could be found with the beef tenderloin. Tender is the operative word, as in melt-in-the mouth. It was perfectly done, with jus, broccoli raab and fingerling potatoes. The featured wine, a Rhone Parallel 45 syrah/grenache, worked well with both our meals. If we’d wanted a bottle, we could have chosen from a wide selection of B.C. and imported wines. I was back in the land of contentment once dessert arrived: a lemon bar with basil and sorbet for my friend and almond cake with fresh berries and sorbet for me. Like the appetizer we loved, these desserts offered a variety of tastes richer in combination. Service was everything you’d expect in a fine restaurant. The exceptional setting is certainly part of the appeal here. Allow time to take a stroll around the grounds and along Deer Lake. You are currently browsing the Les Twarog Vancouver Real Estate and Condo Blog blog archives for August, 2009.